If you need to edit an assessment from the community before adding it to your tracker, you first need to clone it. Cloning an assessment works well if you want to change mastery cut scores or point values in the assessment, convert the assessment to a different mastery scale, change an assessment from formative to benchmark, modify or add the standards it is aligned to, or change the answer key. If you want to make changes to the actual assessment document, you'll need to download it instead of clone it. 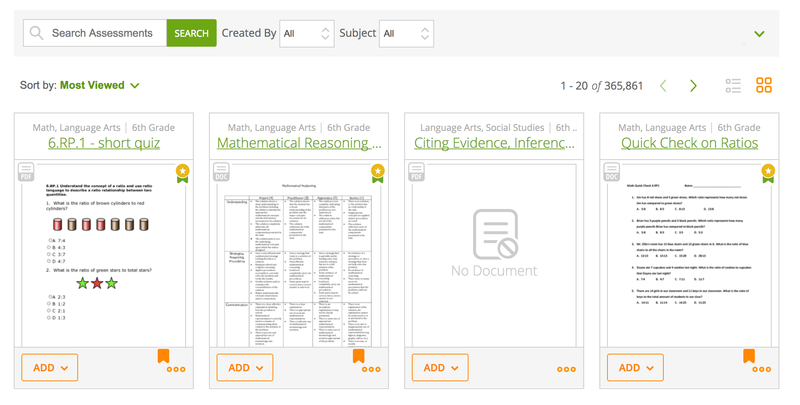 Click on Assessments, and use the filter options in the search bar to find the assessment you want to clone. Click on the Assessment Title. Here, you can see all of the information for the assessment, including the document, scoring, standard, answer key, and the assessment creator. Click on the Clone Icon above the assessment to clone it. Then click on Clone again to confirm you want to clone the assessment and not bookmark it. When you clone an assessment you can change the assessment type, standard alignment, title and description, answer key, points per question, and mastery cut scores. You can also add item tags if your district has them available. When you're done making changes, click on Clone Assessment. You can find the assessment by clicking on Assessments and then clicking on Created.